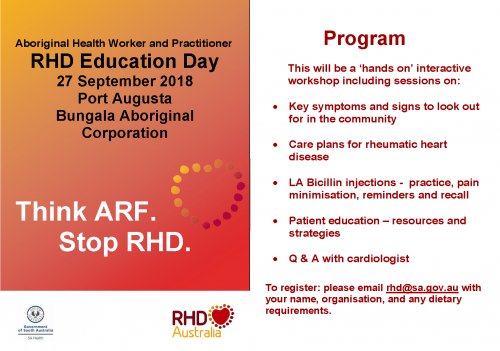 SA Health and RHDAustralia invite Aboriginal Health Workers from across the region to attend a workshop on the 27th of September at Bungala Aboriginal Corporation in Pt Augusta. Workshop presenters will highlight best practice prevention, diagnosis and management of acute rheumatic fever (ARF) and rheumatic heart disease (RHD), and present a range of resources that have been developed to support families and communities. A separate evening session is planned for General Medical Practitioners at the Royal Flying Doctor Service base on the 26th September. This will be led by Adelaide-based cardiologist Associate Professor Christopher Zeitz. Dr Zeitz will discuss current referral and notification systems, and highlight the key elements around diagnosis and management of ARF and RHD.